Sleep deprivation and fatigue – When you are tired your skin becomes dull and pale and the dark tissues and blood vessels under your skin show through more. When you suffer from a consistent lack of sleep, the body produces cortisol, otherwise known as the stress hormone. This hormone causes your blood vessels to dilate so will also contribute to the dark circles around your eyes. Sun damage – A lack of hydration can cause your skin to dry out and look tired. The melanin content in the sensitive skin around your eyes can also increase and produce dark circles. Age – The tear trough deepens with age due to the movement of fat under the eye. 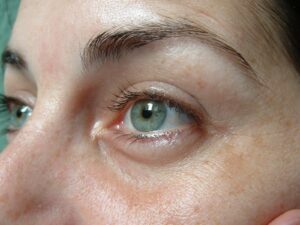 The bulge of fat from the lower eyelid and the fine horizontal wrinkles that form in the skin of the lower eyelid cast a shadow when light hits them from above. Without plumping, the blood vessels show through more easily and the result is dark circles. Medical conditions – Certain medical conditions and allergies can cause dark circles around your eyes, so it is always advisable to visit a medical professional to rule out any serious problems. Dermal fillers are the answer to those dark circles around your eyes! Don’t be disheartened however, we are delighted to tell you that we are able to take these dark circles and treat them with dermal fillers. Dermal fillers have long been used to fill wrinkles and add volume to your skin, but did you know that they can be used to fill in the tear trough and plump it up? The tear trough is the well defined, deep dark hollow that is found between the lower eyelid, nose and upper cheek. Injecting dermal filler here will plump up the hollow and give you a fresher, healthier and more rested appearance. Dermal fillers are manufactured from Hyaluronic Acid. This is a substance that occurs naturally in the body, therefore there is a very low risk of any adverse reaction. The effects are temporary, generally lasting from 6-12 months before the material breaks down. As Hyaluronic Acid attracts water molecules, the skin will look fresher, younger and more hydrated. The treatment takes around 30 minutes. A prescription numbing cream is applied to the injection sites about 15 minutes before the treatment starts. Once the material has been injected the skin is massaged to smooth it out. You will be able to see the results as the treatment takes place. So, if you are fed up with panda eyes give us a call or get in touch right here. We can make you a free appointment to chat about the dark circles around your eyes and how we can treat them with dermal fillers.